Showcasing over a decade of landscape architecture, planning, and urban design. In 2003 we worked with Lango Hansen to create their first web site. After 8 years of faithful service (and periodic updates) the site was showing its age. So we set out to reexamine the best way to showcase their 11+ years of award-winning work. A primary goal was to modernize the site – both visually and technically. The previous site (created long before the iPhone existed) utilized Flash for its interactivity and animation capabilities. The new site was designed to be quasi-responsive: the layout expands and contracts to work equally well on large desktop monitors and smaller screens such as the iPad. Those looking to see very specific types of projects can use the traditional categories (parks, gardens, etc. ), or browse the complete list of projects. But we also wanted to provide an alternate way to access the work, to help visitors discover how different environments can manifest common themes in unique ways. The facets (kinetic, verdant, etc.) 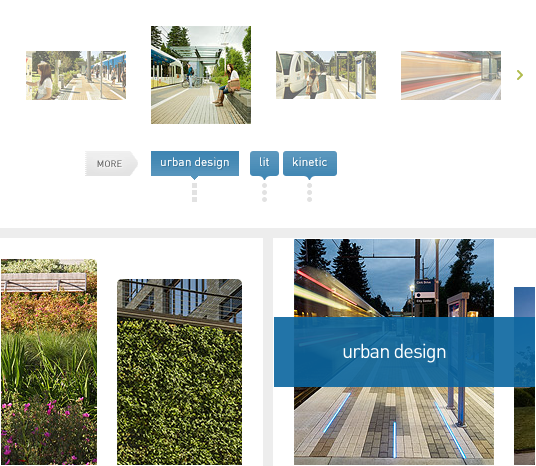 allow the exploration of projects with similar attributes across different categories. For a look at some of the other visual treatments explored, watch the design process video. Lango Hansen Landscape Architects P.C.